Coloured Chair Covers – Make a Statement! 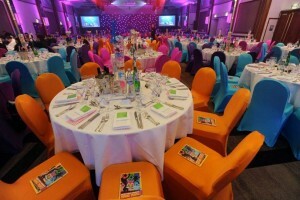 With our range of coloured chair covers you can add the wow factor to any event! 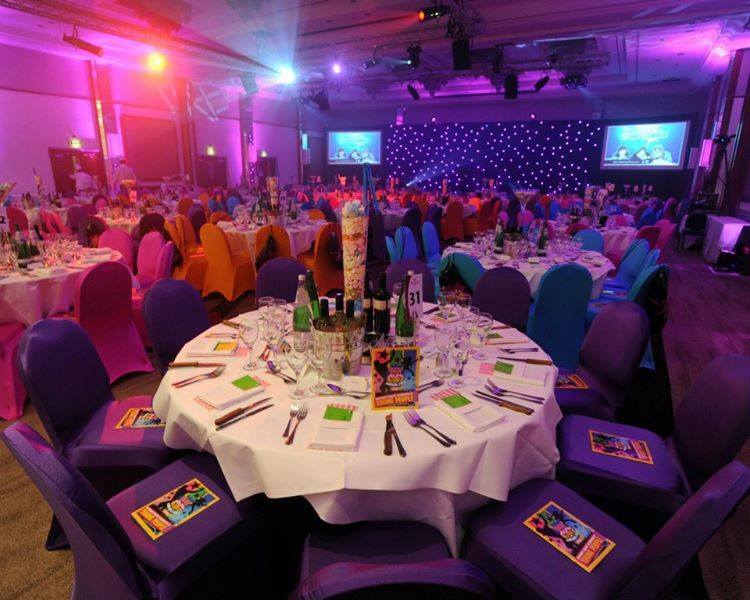 When it comes to corporate events, party nights and award ceremonies our coloured chair covers help create a striking decor scheme! With such high profile events it is important to make ‘a night to remember’ and although adding colour to a space can be done through sashes, coloured napkins. lighting or centrepieces there is a real wow factor achieved with coloured chair covers. These photos were for the Young Scot Awards, organised bt the Daily Record and Trinity Mirror Group, held in the Crowne Plaza Hotel – the logo of the organisation is bright and colourful. 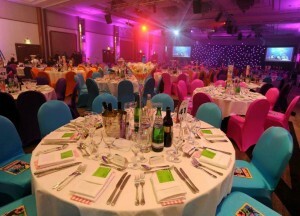 It includes bright orange, pink, purple and turquoise and the organisers of the award ceremony decided to showcase the colours by using the coloured chair covers. We think that the sleek look of the sculptured covers against the plain table linen and centrepieces really makes a statement. Our range of stretch coloured chair covers are available in 21 colours – purple, red, navy, deep garnet, series, chocolate, gold, grey, hot pink, hunter, lilac or lavender, lime, orange, plum or aubergine, royal blue, silver, turquoise, yellow and tiffany blue. These are in addition to our black, ivory and white stretch covers we also provide. These chair covers are our sculptured style that fit can be placed over chairs of any size and stretch to fit them perfectly – creating a great look! They are both sleek and modern looking, making them perfect for a corporate event like we have showcased here. If you are planning an event and need decor then get in touch with Make Believe! We have the expertise to make your event a success! For more award ceremonies, events and the chance to see more coloured chair covers visit our Facebook page!